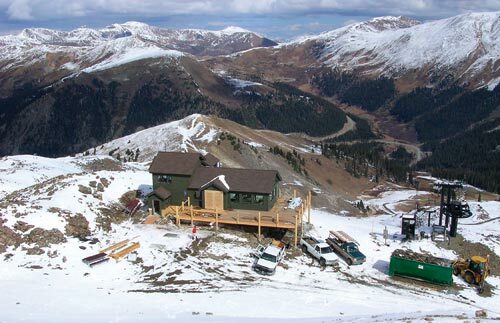 by Dennis Hallahan P.E., Technical Director and David Lentz, P.E., Senior Engineer, Infiltrator Systems Inc.
A new warming hut, which now also includes a much-needed restroom, was designed to replace the old patrol building that had been at the top of Arapahoe Basin for years. As land development in the United States progresses, desirable parcels for development are becoming short in supply. What remains is often land that was historically deemed difficult to develop or undesirable. In addition, an increased awareness regarding the need to protect environmentally sensitive areas has resulted in more restrictive building and development codes, including onsite wastewater system design and installation regulations. These regulations have been and continue to be amended to preserve and protect natural resources and public health. They have also been the catalyst for new thinking in terms of onsite wastewater system design and the development and use of advanced wastewater treatment and disposal technology. Factors that can impact a site and cause it to be considered environmentally challenging may include lot size, proximity to bodies of water or environmental preserves, physical barriers that impede onsite wastewater system construction, or regulatory restrictions that limit construction. The growing supply shortage of easy-to-build sites and the associated escalating prices are causing individual buyers, developers, and builders to purchase land that presents construction challenges in general and, more specifically, with onsite wastewater treatment and disposal. How are regulations for leachfield sizing and construction changing to accommodate challenging development conditions? While the housing construction market is not within the scope of onsite wastewater system regulator responsibility, single-family home construction is a major element of the US economy and is affected by onsite wastewater system regulation. Fluctuations in housing starts can have a profound effect on local and state economies. The relative ease or difficulty of site development can be a function of the standards by which onsite wastewater systems are sized and constructed. If regulations can keep pace with scientific and technological developments, historical constraints on single-family home construction can be responsibly amended or reduced through adjustments to regulations. Such adjustments can allow land development work to proceed on parcels that may not have been developed otherwise. Adjustments to regulations may include approving new treatment and disposal system technologies. 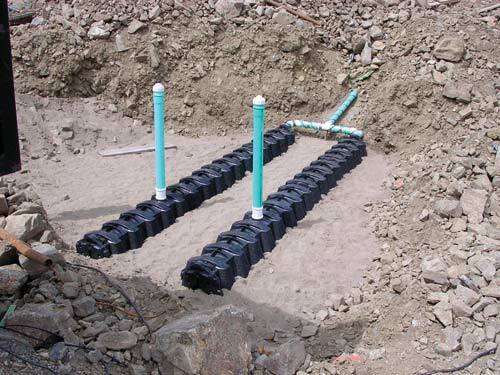 An example of disposal system technology approval is manufactured leachfield products such as plastic leaching chambers, which provide a more efficient means of delivering wastewater to the subsurface. Additionally, with the creation of these new and revised regulations, the regulatory community at the state and local levels is increasingly embracing systems that incorporate advanced technologies. To make responsible changes, regulators have to consider current research findings and integrate those findings into leachfield sizing and construction regulations. Historically, regulations developed for conventional stone and pipe leachfields were based less on science and more on a trial-and-error process. Many regulators are now reviewing the available scientific research findings and third-party testing data and re-examining onsite policy accordingly. This has resulted in a shift away from older onsite system designs to the approval of new technology and advanced applications for both treatment and disposal of wastewater. With the regulatory shift have come further innovations, providing a dramatic increase in the number of options for onsite wastewater systems. In combination with the shift to new technologies, regulators are revising land use policies that consider the array of onsite wastewater system options. Adjustments to these policies have and will continue to be made based on local development and environmental objectives and philosophies. What are the challenges for installers, engineers, system designers, and developers? Installers earn a living from onsite wastewater system installation. As the number of developable building lots using conventional means decreases, installers must also rely on advanced systems and technological innovations to maintain their business. Where repair work is an installer’s mainstay, chamber systems and advanced treatment options can provide a means for upgrading a failing system using reduced space. Similar to installers, engineers and onsite wastewater system designers rely on site design work for their existence, including onsite wastewater system design in many regulatory jurisdictions. With increasingly difficult building lots available for development, the onsite wastewater system engineer or designer is moving toward the innovative space-saving and flexible technologies that can be easily adapted to site conditions. A representative example is an articulating chamber product that can be installed at a reduced size and contoured to match the available landscape. Where developers and builders rely on new construction for their business, the size and construction of the onsite wastewater system frequently influences the way land can be used and developed. The availability of advanced technologies in onsite wastewater systems has allowed developers and builders increased flexibility with respect to land use. Because these systems can occupy smaller spaces, developers and builders have more alternatives related to land use options. What makes a site particularly challenging for onsite wastewater system design? Difficult topography, such as sloping land or topographic depressions can alone make a site a challenge for onsite wastewater system design and construction. Poor soil conditions where fine-grained soils such as silts or clays are present, or where there is a lack of soil structure amenable to infiltration can result in slow percolation rates that require extra consideration and pose barriers to system installation. In addition, shallow depth to bedrock and groundwater, and minimum required separation distances to water bodies, wetlands, and water supply wells can also complicate onsite system design. In many of these cases, access by conventional construction equipment for system construction may be difficult or impossible. Chambers provide the opportunity for reduced system sizing and compatibility with other advanced onsite septic technology. One of the key benefits of using plastic leaching chambers on environmentally challenging sites is that many regulatory jurisdictions allow for a reduced leachfield footprint when using a chamber leachfield. This is because chambers offer increased infiltrative and storage capacity over similarly sized stone and pipe leachfield systems. Reducing the size of the leachfield through the use of chambers frees space within the building lot for other land uses. A building lot with restricted space has more available room for construction of the house or other structures, such as a pool, patio, or driveway when the leachfield sizing can be reduced. The greater infiltrative capacity of chambers, compared to older leachfield methods, can be combined with advanced treatment options such as media filters. These advanced onsite treatment and disposal system designs offer the dual benefit of highly effective treatment in generally smaller-sized disposal areas. They are frequently considered for environmentally challenging sites. The reduced leachfield sizing can also provide more spacing between the leachfield and sensitive areas, such as water bodies, wetlands, or topographic depressions where the depth to groundwater may be shallow. In these situations, a 100-percent sized leachfield may be too large to construct within the constraints of the site. A reduced-size leachfield may fit within the available space and provide adequate spacing from setback lines or minimum separation distances to satisfy regulatory requirements. Where topographic relief is an issue (e.g. steep slopes), chamber leachfields are easily constructed using benching techniques. Chambers can also be installed along the contour of a hillside using the articulating interlocks between the individual chamber units. On sites with obstructions such as trees, landscape features, or rock outcroppings, the articulating feature can also be used to create a curved leachfield that conforms to the footprint of available land, in effect building around the obstruction. On difficult sites, such as existing lots with well-landscaped yards, hilly or mountain top locations, beachfront lots, or wooded sites, access for standard-sized construction equipment can present logistical issues. 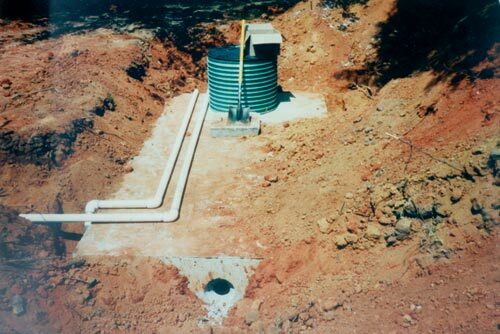 For these types of sites, advanced onsite wastewater systems including a chamber leachfield, offer several advantages. Since aggregate is not required for construction of the chamber system, access for heavily loaded dump trucks is not required. Preparatory work in difficult-to-reach locations can be achieved using small-sized construction equipment and lightweight chamber units can be easily hand-carried to the restricted-access area. The reduced size of the system lowers the overall cost and the capital expenditure for system construction is reduced. Also, with chamber systems, the elimination of the need for heavy equipment and the reduction in time for installation by up to 50 percent compared to systems with stone and pipe leachfields also reduces overall cost. Beachfront property can be particularly challenging due to the fast percolating sandy soil conditions, shallow groundwater table, close proximity to the ocean, and small lot size in comparison to the structure to be built. In Trankas Beach, California, system engineer John Yaroslaski, owner of Ensitu Engineering of Morro Bay, was challenged to design a system for a very small lot with a large dwelling and the potential for regular high usage. Due to the lack of available space, the system needed to be installed under the central patio and still comply with local regulations. Local codes allow for a reduction in disposal area sizing if advanced treatment is used. Therefore, Yaroslaski began to look at advanced onsite treatment options, combined with chambers for the disposal system. This combination would provide treated effluent and an efficient, reduced-size leachfield that would fit within the site-specific space constraints. In the system Ensitu designed for Trankas Beach, wastewater flows from the house to a pump basin with sewage ejector pumps manufactured by Orenco® Systems, Inc. It is then pumped up to a Bio-Microbics FAST® Aerobic Treatment Unit, which reduces biochemical oxygen demand and suspended solids levels, treating the wastewater to levels similar to that of a municipal wastewater treatment plant. Next, the effluent travels to a dosing tank that includes an Orenco Biotube® pump system. From the dosing tank it is pumped to the Infiltrator® chamber leachfield, a bed with a grid layout including approximately 20 plastic leaching chambers. Engineered sand with consistent particle size and properties was brought to the site and placed over the native sand in the disposal bed. No gravel was used in the system. From the chamber disposal bed, the treated wastewater returns to the environment. In Broad Beach, the system design was very similar except for the fact that the disposal field is located under the lawn and that this property is on a hillside lot. The slope eliminated the need for a pump to move the wastewater from the house to the aerobic treatment unit. Arapahoe Basin is part of the Vail Resort family of ski areas. 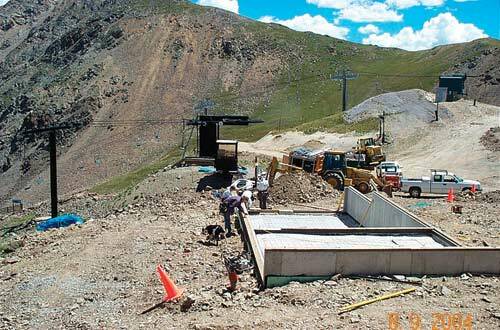 The resort wanted to offer skiers and the First Aid/Ski Patrol personnel some relief from the harsh elements at the 12,500-foot mountaintop along with restroom facilities. A new warming hut, which would now also include a much-needed restroom, was designed to replace the old patrol building that had been at the top for years. Due to the high elevation, difficulty with access, strict environmental codes, and the reality of frozen ground conditions during the period that the facility would be in use, the resort had to look at easy to transport and operate options for this installation. Allen Henceroth, Director of Mountain Operation at Arapahoe Basin researched a number of options and decided on the use of a Clivus Multrum Composting Toilet in conjunction with a small leachfield designed to capture and store any liquid that happens to get past the composting procedure. The Summit County (Colorado) Department of Environmental Health recommended the use of Equalizer® 36 chambers from Infiltrator Systems Inc. for the leachfield. Sand was transported up the mountain and placed in the leachfield area. The chambers were then installed on top of the sand in a small bed with four feet of cover. Due to the frozen ground conditions and heavy snow cover, the leachfield will serve primarily as a storage area during the 225-day winter usage period. When the snow melts, any remaining wastewater will be pumped for disposal and the system will be allowed to rest for the summer months. Engineers, designers, installers, and regulators now have many options to choose from in non-conventional, advanced onsite wastewater systems. With the increase in options have come a broader acceptance and a new look at technologically advanced onsite wastewater systems by the onsite wastewater management industry. However, change can come slowly and some seasoned onsite industry veterans continue to depend upon older technology for onsite system design, construction, and regulation. As the need to develop less desirable land increases, there has been much progress in the development and the acceptance of advanced onsite systems and the science behind these technological advances. Most states and local health departments have created or revised regulations that accommodate advanced onsite systems, including chamber leachfields, at reasonable sizing reductions, as well as treatment units. Continued product testing and research are needed for advanced onsite wastewater treatment technologies to identify associated capabilities and limitations. For manufactured leachfield products, this work includes third-party checks on dimensions, performance, and liquid storage capacity. For treatment units, this work includes investigation of the expected level of treatment during various usage conditions and long-term system reliability. These data will spur the continued development of more effective and cost efficient alternatives. These alternatives will provide options for onsite wastewater treatment that will enable better protection of natural resources and make possible building and usage of challenging sites. For more information contact Infiltrator Systems Inc., at www.infiltratorsystems.com or call 1-800-221-4436.